Just as literature graduate students never admit that there are books they haven't read, we urbanist pundits aren't supposed to admit that there are cities we've never been to. In fact, we're so up to date in our lived experience that there are no great cities we've never been to recently. Tip: We're all faking it, mostly with Google Earth. So, to keep up my outsiderish reputation, I'd like to announce that I haven't been to London for 19 years, and I've never been to Dublin at all. Fortunately, that's changing this month. I'll be in London March 14-16 and Dublin for a week following that. What does a transit consultant with North American and Australasian experience do with just a couple of days in London, or with a full week in Dublin? With whom should he meet? What experiences must he have? I have my own ideas, but I love the fact that so many of you know these cities better than I do. Have at it in the comments! Guardian journalist Bim Adewunmi recently traveled from London to New York and slammed the subway as compared to her beloved Underground. The blowback has been delightful. She seemed especially angry about the information system that isn't exactly what Transport for London would do. The city’s subway map is dense and needlessly complex. Where in London the Central line (red) is distinct from the Piccadilly (dark blue), which is markedly different from the Hammersmith and City line (pink), New York’s map has designated the same forest green to the 4, the 5 and the 6 lines. The B, D, F and M all rejoice in exactly the same shade of violent orange. … Why would you do this? The whole thing resembles a child’s approximation of a city transit system: it makes no sense. She's talking about branching lines. If she were from Paris, whose elegant Métro is nearly branchless, she'd have a point. But what a comment for someone from London! No 4, 5, and 6 to confuse you! No, just a beast called the Northern Line even though it's both northerly and southerly, consisting of two entirely different lines through the central city. Is there a direct train from Waterloo to Mill Hill East? How would I know? As Clive's Underground Guide helpfully explains: "The pattern of service … tends to change with each new issue of the timetable." You see, Bim, Americans like maps and nomenclature systems that actually indicate where their train will go! In London I'm sure you just somehow just know what the next Northern Line train might be up to. But all that aristocratic just knowing that you Brits do is exactly why you lost your Empire! You've seen photos like this. A large group of people, with images comparing the amount of precious urban space they take depending on the mode of transport they use. This new one is by Australia's Cycling Promotion Fund. Bike racks on buses (and most other transit) can never be more than a niche market. The rack on the bus in pic #1 carries two bikes, which is great for those two people. But if all the bikes in pic #2 try to get onto the bus in pic #1, we have a geometric impossibility. Bike racks are already as large as they can be if the driver is still to be far enough forward to drive safely. A non-folding bike inside a transit vehicle takes the space of several passengers, so could fairly be accommodated only at several times the fare. In the ideal sustainable future, you will have to park your bike at the station, or return your rental bike, just as Europeans do. If transit does accommodate your bike, you really should pay a fare premium that reflects the rough number of passenger spaces displaced, or the supply/demand ratio for 2-3 bike racks vs 20 people wanting to use them. 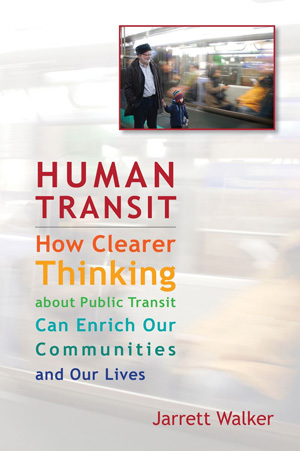 "Personal Rapid Transit," or small demand-responsive buses, or driverless cars that work like taxis, will never, ever, ever substitute for surface transit in high-demand urban settings, such as where all these people want to travel. Dreamers along these lines may well be right about many suburban areas, where demand is sparse and the land use pattern precludes efficient transit. But when all the people in this picture want to travel, driverless cars may take less space than the cars shown here, but they will still take far more space than a bus would. The scarcity of space per person is part of the very definition of a city, as distinct from suburbia or rural area, so the efficiency with which transport options use that space will always be the paramount issue. In cities, urban space is the ultimate currency. We spend too much time talking about what things cost in dollars and not enough about what they cost in space. That, of course, is because urban space is perversely priced to encourage inefficient uses of it and discourage efficient ones. If you're going to claim to be able to visualize how technology will change the world of 2040 — as the techno-futurists claim to do — you should also visualize what a political system ruled by people now under 40 would look like. These people are much less emotionally attached to cars, care about environmental outcomes much more, and value urban space much more than their parents do. Given that the revolution in urban pricing has already begun (see the London and Singapore congestion charges, and the San Francisco and Auckland dynamic parking systems), isn't it foolish to assume that today's assumptions about how we apportion urban space will still rule your techno-utopia? the photo understates the space requirements of bikes compared to the other two. Once you put these three systems in motion, the cars and bus will need more space in one dimension — forward and back. However, in motion, the mass of bikes will expand in two dimensions, it will need to be both longer and wider for all the bikes to move safely. This could have been rectified in the photo by consciously spacing the bikes to a distance where riders would feel comfortable at a brisk cycling speed that ensures not only stopping distance but also space for passing. Masses of cyclists on a recreational ride may all agree to ride in tight formation at the same speed, but in daily life cycling infrastructure must accommodate the the fact that people in a cycling crowd will have different desires and intentions around speed, which affects lateral spacing and stopping distance. It's from a wargamer's analysis on how to get a seat on the London Overground, easily applied to other rail transit systems! Here's a fun weekend read, by British transit-marathon champion Adham Fisher, shown at right in the process of conquering Madrid. You know you love your transit system when your community can honor exploits such as his. I admire rail fans. Though I am sure that other nations have people who yearn after trains, I almost consider it a typically British pastime. Individuals take a day out to descend on a station where they know lots of weird and wonderful trains will pass. Notebooks in hand, they write down the numbers; cameras on tripods, they take photographs of the carriages, and a different train in an unusual location is always a bonus. At these platform picnics can be a good social atmosphere. And the amount of knowledge rail fans have is astonishing. But I don’t like public transport to that extent. I wouldn’t want to stay in one place all day documenting things. I like to move. Rail magazines here might deal a lot with main line intercity and heritage trains. But I like city trains, specifically urban rapid transit. I try to go around underground rail networks as quickly as possible in one day, visiting every station. There is actually an official Guinness World Record for doing so on the London Underground – currently 16 hours, 29 minutes, 13 seconds – which I have attempted 11 times, often completing the system but not touching the record. I have also undertaken similar challenges on buses and trams. This is not easy. Notebooks are required for this exercise to write the route down station by station, the arrival and departure times at/from each and the operating numbers of the trains. Cameras are required to take photographs of every station. Every so often, a challenger must ask a generous member of the public to sign a witness statement, saying they were where they say they were. Basic fitness is useful; if one wants to travel as quickly as possible, they must run when they transfer. Just one train missed could mess up the schedule entirely. Running is not restricted to stations, and neither are the participants. Guinness rules allow running or the use of other scheduled public transport to travel out of the system between adjacent stations, which can save time; the train need only arrive at or depart from the station for it to count. It is physically and mentally demanding, being up extremely early, probably not going to bed until very late, with no guarantee of success due to service delays, line suspensions and signal failures which can occur any time of any day, as regular commuters know. One of these can mean the end of an attempt if it slows you down enough and prevents you going further. And the average commuter who hates the Tube and tries to spend not one single second longer on it than absolutely necessary, will surely ask: why? Why would you want to waste a whole day underground doing something that pointless? Admittedly, I’m not quite sure. After all, public transport is merely a mundane and functional thing, no? Designed to ferry people from home to work, A to B, and nothing else. But the beauty of something like this is that I can make the ordinary extraordinary. I can buy a travelcard and the amount of single journeys I make per attempt add up to many times that cost. An unorthodox exploitation of the system. I have been greeted with incredulity and called eccentric by some for doing what I do. Of course, it is not a normal activity; I admit that straight away. But neither is climbing a mountain. Mountains are in far away places with treacherous terrain and tangible danger. People climb mountains because they are there, and the same reasoning applies to those who choose to make much more out of something ordinary on their doorstep. Mountain climbs are many times more demanding, and I don’t think I could do one; I would rather spend several hours underground on trains than eight miles up Everest in temperatures well below freezing and extremely thin air. No other official world record is considered for traversing a transit system apart from in New York, so the fact I have performed the feat in other cities will no doubt seem even more pointless. Having attempted the London record several times without success, I began to look at other maps, realising it could be even better to plan a route around a system where perhaps few people might have done the same. With a wealth of European metros just across the Channel, I have visited every station in cities including Paris, Madrid, Brussels, Amsterdam, Rotterdam and Lille. The challenges are worthwhile when completed, but being recognised for it is also a major bonus. I have been interviewed on radio, been the subject of a museum story, but the best reaction was to my first attempt out of Europe, on the Chicago L. I told one or two people I was doing it and was asked to contribute to the main CTA blog. It became perhaps the most debated story of 2011 in the comments section. A while later, three students read about what I had done and tried to do the same thing, but were slightly slower. Articles were written about them and my name started to be dropped as the “record holder”. Next thing I know, I am contacted by the CTA to be informed its President, Forrest Claypool, wants to write to me personally. Which he does, also sending me a special Chicago-styled station sign with my name on. Such recognition is, in many ways, better than a world record. Has any other transport authority honoured an individual for riding its system to extremes? No Guinness certificate but I can joke about having a station named after me. Paris yielded another special run, and led to my other public transport project. At the same time as planning the excursion, I happened to be writing a song with my friend Annanem called Métro, which listed every station in alphabetical order. I was being discussed and thought that if we finished the song in time, it could be another promotional tool. So we put it on YouTube the week before I went out. A short clip was played on French radio to accompany an interview I gave them. Afterwards, I thought of returning to Paris to play the song live, having been told it was very off the wall. Only having the one tune and hoping to secure a gig, I asked several people if they would like to write songs, poetry, anything, about a rapid transit system of their choice. Enough material was submitted for an album, which I compiled and called the Metro EP (cover at left). All artists were given the collective name 1000 Stations. I and two other contributors launched the album in Paris, playing it in an arts venue and also giving out CDs to a few people on the Metro, explaining what it was about. We have just played the first UK gig with the project and hope to release it very soon. That is an example of public transport creativity. An album was born out of my tendency to use public transport in an unorthodox fashion, which I think itself is a bit creative – devising the potentially quickest way to go around a rail network, poring over maps, plans and timetables, making transfers that would seem silly to a local. And it’s incredibly exciting to do, especially when you don’t even know the city. I had never been to Madrid before, and with the route drawn up at home, had just one or two days to research properly and become accustomed to the Metro before I attempted to visit all 235 stations. The Tube Challenge has gained popularity in recent years; there are a few websites dedicated to it and an entire online forum bustles with record holders and hopefuls. The New York Subway’s Ultimate Ride has had followers for decades; the Amateur New York Subway Riding Committee was founded in 1966. Moscow has had English teams flying out to tackle its architecturally magnificent Metro. Others have tried Paris, and I am sure several people have been all the way round on small networks like that of Glasgow. You might consider having a go at this. Not necessarily at a fast pace, but how you like. I know of someone who visited every Paris Metro station in six months. Break out of the box, make as many journeys as you can, ride on every single piece of track, tell the system what you want to do. You will have a different perspective of a city. Regarding my Chicago journey, a spokesman for the CTA said “We have a lot of people in Chicago who ride the L every day and would never even think of doing anything like this.” So you’ll be one up on the locals and join an elite club. And even if you are thought of as eccentric, someone might say to you “I couldn’t do that”. Like me with mountaineers. And rail fans. Spatial maps are about spatial distance, and that's often, but not always, what matters. The classic London Tube map is useful as a diagram, for example, but it can also undermine people's actual mental understanding of the geography of London. Maps that show one useful geography correctly seem so naturally authoritative that we can easily overvalue them when we really care about something else. … then you're misreading space as population. The visual impression of dominating such a map arises from appealing to sparse rural voters who influence large spaces on the map. Winning an election is something else. The guy who won the orange counties did as well as the guy who won the purple ones, because the orange counties are where most people live. (Updated) Back in the 2004 election, some smarter cartographers attempted maps (technically cartograms) in which each bit of area represented a fixed number of voters. (Thanks to Niralisse for finding them for me!) The US was reshaped into something looking like an angry cat wearing a corset, the mountain states reduced to almost nothing while the West and Northeast were enormous blobs. It took a while to get into, but it was an accurate visualization of what voters did. It was a useful redistortion, arguably a net reduction in distortion, because when describing population-based data, a spatial map like the Iowa caucus map above is a distortion too. Inevitably, as technology customizes everything around our individual narcissism perspectives and preferences, we'll get more used to "just for me" maps, maps that show how the universe really does revolve around ourselves. These are crucial for their purpose. I've especially praised this one, which shows where you can get to on transit, in a given time, from a point that you select. Ultimately, a clear vision of your city, your transit system, and your place in the world can only come from being able to move quickly between different kinds of maps, so that you're reminded at each moment that no map tells the whole story. We must be able to redistort for ourselves, in real time. If everyone had the tools to toggle quickly among different kinds of diagrams, they might even get over the notion that a spatial map tells you anything about an election.